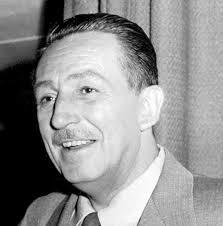 Walt Disney (1901 – 1966) was a film producer, media magnate and co-founder of the Walt Disney Company. He was an iconic figure in the Twentieth Century media and entertainment industry, helping to produce many films. With his staff, he created famous cartoon characters, such as Mickey Mouse and Donald Duck; his name was also used for the successful Disney Theme Parks. During his lifetime, he received a record 59 Nominations for the Academy Awards, winning 22 Awards. Walt Disney was born on 5 December 1901, in Chicago. His parents were of German/English and Irish descent. As a child, the Disney family moved between Marceline in Missouri, Kansas City and back to Chicago. The young Walt Disney developed an interest in art and took lessons at the Kansas City Institute and later Chicago Art Institute. He became the cartoonist for the school magazine. When America joined the First World War, Walt dropped out of school and tried to enlist in the army. He was rejected for being underage, but he was later able to join in the Red Cross and in late 1918 was sent to France to drive an ambulance. In 1919, he moved back to Kansas City where he got a series of jobs, before finding employment in his area of greatest interest – the film industry. It was working for the Kansas City Film Ad company that he gained the opportunity to begin working in the relatively new field of animation. Walt used his talent as a cartoonist to start his first work. The success of his early cartoons enabled him to set up his own studio called Laugh-O-Gram. However, the popularity of his cartoons was not matched by his ability to run a profitable business. With high labour costs, the firm went bankrupt. After his first failure, he decided to move to Hollywood, California which was home to the growing film industry in America. This ability to overcome adversity was a standard feature of Disney’s career. With his brother, Roy, Walt set up another company and sought to find a distributor for his new film – Alice Comedies – based on the adventures of Alice in Wonderland. In 1927, the Disney studio was involved in the successful production of ‘Oswald the Lucky Rabbit’, distributed by Universal Pictures. However, with Universal Pictures controlling the rights to ‘Oswald the Lucky Rabbit’, Walt was not able to profit from this success. He rejected an offer from Universal and went back to working on his own. 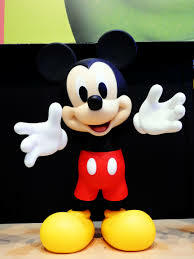 It was at this point that he created the character – Mickey Mouse (originally called Mortimer Mouse). Ub Iwerks drew Mickey Mouse, and Walt gave a voice to the character. The Mickey Mouse cartoons with soundtracks became very popular and cemented the growing reputation and strength of Disney Productions. The skill of Walt Disney was to give his cartoons believable real-life characteristics. They were skillfully depicted and captured the imagination of the audience through his pioneering use of uplifting stories and moral characteristics. In 1932, he received his first Academy Award for the Best Short Subject: Cartoons for the three coloured ‘Flowers and Trees’ He also won a special Academy Award for Mickey Mouse. Disney always had a great ability to know what the public loved to see. After the success of Snow White and the Seven Dwarfs, the studio produced several other successful animations, such as ‘Pinocchio’, ‘Peter Pan’, ‘Bambi’ and ‘The Wind in the Willows’. After America’s entry into the Second World War in 1941, this ‘golden age’ of animation faded and the studio struggled as it made unprofitable propaganda films. In 1941, Disney also had to deal with a major strike by his writers and animators. This strike left a strong impression on Disney. He would later become a leading member of the anti-Communist organisation ‘Motion Picture Alliance for the Preservation of American Ideals’ (the right-wing organisation was also considered to be anti-semitic.) At one point, he (unsuccessfully) tried to brand his labour union organisers as Communist agitators. However, in the 1950s, Disney distanced himself from the Motion Picture Alliance for the Preservation of American Ideals. However, by associating with the organisation, he was often associated with the anti-labour and anti-semitic philosophy it expressed. Disney was a Republican, though was not particularly involved in politics. It is often asked whether Walt Disney was anti-semitic. Walt Disney believed in the benefits of a religious approach to life, though he never went to church and disliked sanctimonious teachers. He respected other religions and retained a firm faith in God. In the late 1940s, Walt Disney began building up plans for a massive Theme Park. Walt Disney wished the Theme Park to be like nothing ever created on earth. In particular, he wanted it to be a magical world for children and surrounded by a train. Disney had a great love of trains since his childhood when he regularly saw trains pass near his home. It was characteristic of Walt Disney that he was willing to take risks in trying something new. After several years in the planning and building, Disneyland opened on July 17, 1955. Disney spoke at the address. The success of Disneyland encouraged Walt to consider another park in Orlando, Florida. In 1965, another theme park was planned. Walt Disney died of lung cancer on December 15, 1966. He had been a chain smoker all his life. An internet myth suggested Walt Disney had his body cryonically frozen, but this is untrue. It seems to have been spread by his employers, looking for one last joke at the expense of their boss. After his death, his brother Roy returned to lead The Disney Company, but the company missed the direction and genius of Walt Disney. The 1970s were a relatively fallow period for the company, before a renaissance in the 1980s, with a new generation of films, such as ‘Who Framed Roger Rabbit’ (1988) and ‘The Lion King’ (1994).